Welcome to all who are new, and who are regular visitors to this site. This isn't a Gothic site, though the images of Transylvania do invoke that sort of feeling. 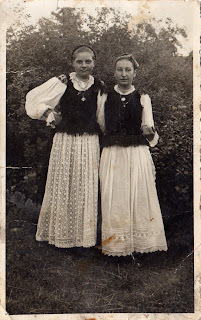 Many have made the comment, but this blog is about the real Transylvania, the people, the places, the royalty. 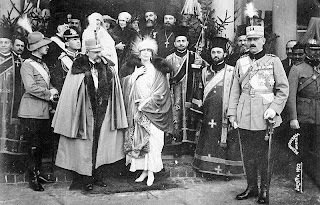 The above photo is of Queen Maria of Romania and her husband King Ferdinand and their son, the future king Carol II. Carol was named after his great-uncle, who didn't rule in Transylvania but was king of a much smaller Romania. This photo above is of two women who lived during the reigns of both King Ferdinand and Carol, as well as King Michael. They are Saxons and they heard many an announcement made about the Kings, and longed to see them. They got their chance later in life, when King Michael visited their new country, as they left Transylvania, never to return in 1944. And they wish they could go back to see Transylvania once more.